The perfect breakfast has never been better, now that you have this recipe for Prosciutto and Eggs Benedict. 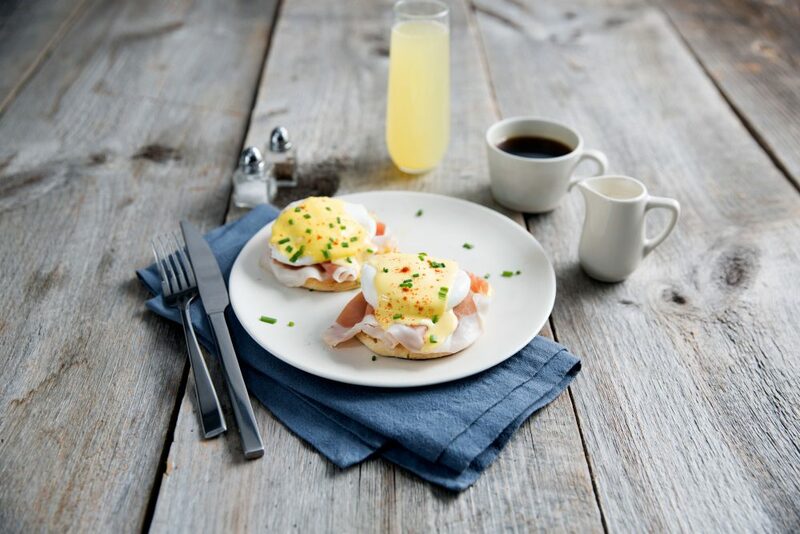 It’s no secret eggs benedict is almost everyone’s longtime breakfast favorite, so adding iconic Prosciutto di Parma should be an obvious choice. This dish takes prosciutto and eggs to a whole new level by turning them into a gourmet breakfast fit for everyone from kids to the in-laws with the perfect homemade hollandaise sauce. Enjoy with your go-to cup of coffee, or kick things up a notch and pair with your bubbly brunch beverage of choice, like Champagne, to pull everything together. Mimosas anyone? In a microwave safe bowl, heat remaining butter until melted and hot. Set aside. Meanwhile in a blender, combine egg yolks, lemon juice and mustard until smooth and well blended. With blender on, slowly add hot melted butter and process until a thick sauce has formed. Top toasted muffins with crispy prosciutto, egg* and sauce, distributing evenly. Sprinkle with smoked paprika and chopped chives, if desired. Preheat oven to 400°F. On a baking sheet, arrange English muffins cut side up and bake until toasted, about 15 minutes. Spread 3 tablespoons butter over toasted muffins and keep warm. On a parchment lined baking sheet, arrange prosciutto and cook until crispy, about 5-7 minutes; set aside. Meanwhile in a large pot, bring water and vinegar to a boil over medium-high heat. Using a slotted spoon, stir the water until it begins to swirl. Quickly drop in two eggs water and cook until egg whites are opaque and centers are runny, about 3-4 minutes. Using a slotted spoon, remove eggs and transfer to a dish. Repeat with remaining eggs, two at a time. *To warm up eggs before assembling, dip in boiling water for a few seconds. This recipe is also delicious with uncooked prosciutto!